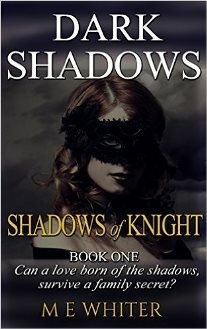 Shadows of Knight (book) by M E Whiter.Sebastian is the tall, dark and very handsome CEO of Knight Enterprises. He’s haunted by a troubled past of his own making, or at least one he’s decided to take full responsibility over. According to him, it has sealed his fate, dooming him to repeat the same mistakes over and over again. That is, until she stumbles into his life quite literally, giving him the glimmer of hope, his run of bad luck, has finally come to an end. Only problem is, she ends up becoming another victim . . .
Rachel is a feisty and independent redhead, who’s burning ambition is to become a successful and professional artist. From the moment she receives an invitation, offering her an exciting opportunity to further her career, and an all expenses trip overseas, she feels like she has just won the lottery. But, when tragedy strikes after Rachel's first week in Vancouver BC, is it fate that brings her and Sebastian together, or is a dark secret hidden in the past, controlling them like pawns in a chess game? Let yourself be swept away by Part One of Dark Shadows, an intriguing romance, that begins with so much promise. But be warned! Games of strategy always come with pitfalls and hidden agendas, so keep your eye on the page at all times. Shadows of Knight is a story about Rachel Day and Sebastian Knight, two star-crossed lovers, who must learn to trust each other, in order to survive an unknown threat, determined to destroy them both. But, will they manage to survive each others demons first, in order to have any hope of a future together?